Preview #5 coming right up! green edifices of light, oceans of space, strange music, and shadowy mountains and valleys. But most of all did he dwell upon some mysterious blazing entity that shook and laughed and mocked at him. This vast, vague personality seemed to have done him a terrible wrong and to kill it in triumphant revenge was his paramount desire. In order to reach it...he would soar through abysses of emptiness 'burning' every obstacle that stood in his way. The ranting stopped as suddenly as it had started. This was the first of what would become nightly "attacks" of a similar nature. 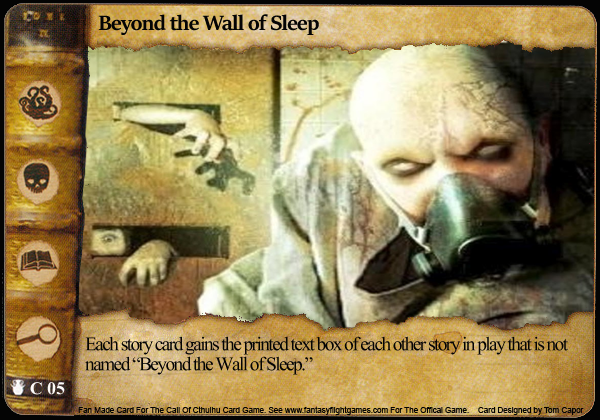 The peripheral otherworldly images of Slater's visions were different and more fantastic with each successive night"
In the Beyond the Wall of Sleep, an intern, performing telepathy experiments on a criminal insane murderer known as Joe Slater eventually led to the above. Every night... nightmares... not matter what story you got too... nightmares. 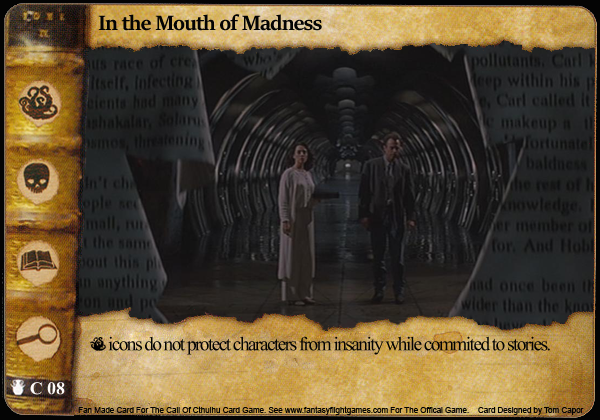 The some of the described parts of the visions also tie in with some of the other story cards in the set as well. I'll likely dedicate the remaining slots to any missing vision descriptions in an effort to really tie the story set together. As far as actual game play... This sucker entering play might be a boon of riches, or complete despair for the players involved. Or it'll be a giant cluster ****. I except this to be the most polarizing of the story cards as it takes all of the craziness I'm attempting to provide and multiplies it by 3. This can either be REALLY fun or REALLY frustrating. I'm betting on the former. With so much destruction, I thought I'd whip up a way to recover. The story is centered around Herbert West, a doctor convince that the dead could be "turned back on." Shunned, he went through countless failed experiments until he got his hands on the corpse of his rival.Hard to call it a successful reanimation, but he did succeed at turning the corpse back on. I know Greg's card was called Assistant to Dr. West, but after Graham... I couldn't help feel the need to include Greg since his card still hasn't made it back into the lcg! So which character will you be? West or his rival, Dan Cain? Well, with time running out for this evening... so I apologize for the rush, but wanted to get these out before I shut down for the night. Story of an artist's paintings, thought to be images of a deranged mind, turned out to be portraits of real things! In a attempt to bring pieces of art (support cards) to life (turning them into characters) is my attempt to bringing the story to your gaming table. Story ending with world wide insanity! Really, I just wanted to see what the game would be like if terror icons were just weaker combat icons and didn't come with Willpower by default. My guess... should make things a lot more interesting when evaluating your commits. The stone in the well leaves nothing around it alive...the weak fall first. Winning this story shall create some serious effort and finally gives a bit of support for icon-less characters. Goal for tomorrow is to find the remaining 3 stories, fix any errors found between now and then. Adjust as necessary and with any luck I'll have the pdf available tomorrow! Click on the below link or the link in the now edited first post to view and download. Thank you all for the support and enjoy! For those of you who are brave enough to try em out... let me know how they changed up your game! Wow, I love The Book's effect. That's the kind of interesting effect on play I want from story cards. I love these but would have no idea how to play against them haha glad these aren't tournament legal be very long games because would have to think so so much just to know where to commit, however, for causal play these are amazing (: thank you! 1) So I absolutely LOVE seeing struggle sequences different than the standard TCAI model. The game is much more of a chess match when you have to think through the struggle order in addition to the rest of the combat math. I'll also offer that changing the standard of "5 tokens to win" is another exciting idea. Turning off Unchallenged, increasing the counts, etc. Good stuff. 2) Pickman's Model: Should likely say "with no printed struggle icons" just as a clarification for all the rules lawyers out there. 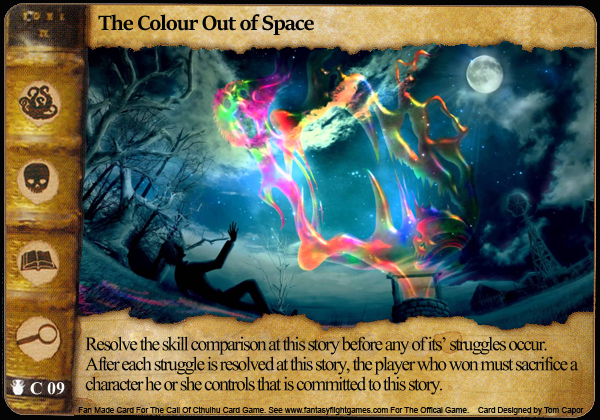 3) The Colour Out of Space: I like the idea, but if I may assume, the story could result in the loss of 5 characters (including a combat kill)? Who would ever run it? Will it just sit in play? Lastly, a Story idea I had years ago. What about a story that said something like "Players may only gain a maximum of 2 success tokens per phase at this story. Characters at this story do not uncommit until a player succeeds at the story." My idea is that there would be a long, buildup of characters, like armies gathering. Thoughts? 2. I believe that icons should only be added when specified. I could add reminder text that it doesn't get any icons, but... think people will power through just fine. 3. The Colour Out of Space is... an exercise in thinking completely differently of about how to approach a story. Yes, up to 5 characters could lose their lives (remember, you actually have to WIN the struggle, ties and losses won't cause the story to trigger)... so I don't expect anyone to bother sending a mass army at the story. Unless they were ok at covering the losses. But, by putting the Skill challenge first, it's possible for the active player to skill pick up to 2 tokens (likely only 1, but still) before any struggles resolve. So, characters without terror icons or no icons at all are going to be your friend when comitting to Colour Out of Space. Get in there, get a token for skill, and hopefully lose a character to insanity to cause your opponent to lose a character. If you get to combat, it'll be a trade off, each player will lose a character. So the story really speaks to faster decks in the first few struggles, but, Arcane and Investigation will eat faster decks alive. On the flip side, as the defender... how to defend can become a major challenge and can work out to their advantage but either aiming for ties or "letting" and opponent get ahead so several struggles are lost. Ultimately The Colour Out of Space is a story you can chip away at with what you would normally consider you're weaker characters. For two reasons, 1, don't care as much if the bite the big one. and 2, they're the best at limiting the damage. It's a card that makes bad cards better and good cards a little worse. 4. I think you might be confusing "winning a story" and "succeeding at a story." 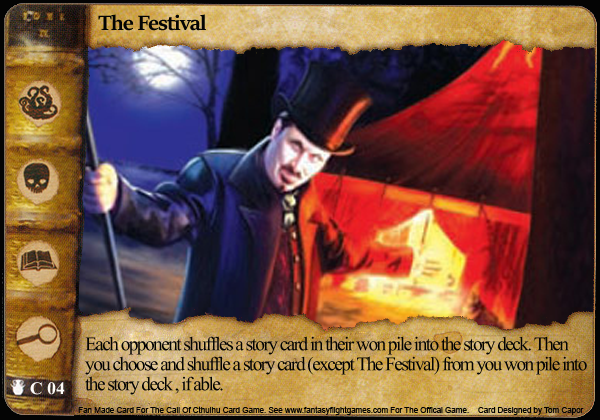 When a player wins, the story it is moved to the won pile and the tokens are indeed removed. However, succeeding is when the active player wins the skill challenge at a story (thus placing 1 (2 if unchallenged) success token). Yep, don't do it! One of the Cenacle players had started a similar thread a couple of years ago and as soon as he made them available via arts cow, he was asked by FFG to remove them. Since you are using original licensed artwork, you may not use it in any way that would allow anyone to make a profit (like arts cow). On a different note I noticed there's a typo on the Nameless City: it says 'pinted cost' instead of 'printed cost'. No problem, I've printed my own copies. It would be nice to have them on real card paper but it's not a big deal, I can do the back + sleeve method. Unfortunately we have relatives coming into town so I'll be missing game night this week. Look forward to trying them out next week though. Doh! I knew I couldn't escape typos. Thanks J, and if your or anyone else comes across any.... let me know! Updated in the first post as well, but here is a link to the correct version of the .pdf with correct The Nameless City. 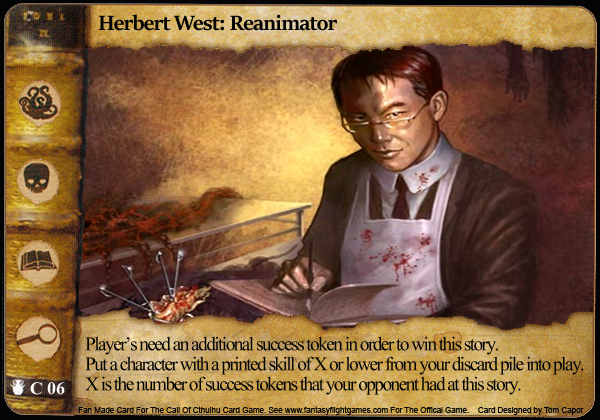 Just noticed the other day when it came up in a game that Herbert West: Reanimator appears to be missing the end of the final sentence. I made up a couple of sets of these for me and my usual opponent; they look boss! Here are my impressions of the story effects. I'm a little confused by At the Mountains of Madness. I understand it best like this: When checking for success, you cannot claim a bonus token for being unopposed as long as there had previously been some opposing character at the story this phase (i.e. who may have been killed or made insane, returned to hand or whatever). Is that right? The way I play, Beyond the Wall of Sleep becomes an automatic priority to win. Activate or no, its effect needs to be taken down as soon as possible, and preferably under my control! The Book: Now we are all lunatics. Nice. Typo in The Colour Out of Space: Another superfluous apostrophe, this time in its struggles. If I'm building a deck with foreknowledge that The Doom That Came to Sarnath might be in the mix, Stone Calendar becomes mighty appetizing. Typo in The Music of Erich Zann: The imperative verb phrase should be remove from the game (not "removed from the game"). I like this one a lot, although it does seem like a bit of a gift to Hastur decks. I do see that the mythos-favoring terror business is mitigated by putting the Investigation struggle first. My usual opponent is going to love The Festival. He hated it when we found out how The Well was really supposed to work. If The Nameless City is in play, I can't think that I would want to approach it as the active player! No thanks! Man... I really need to come back and fix these. Typos are not uncommon with me and... I make no apologies! Suffer my typos and grammatical errors! Muwhahahahaha! Anyway, I suppose I can at least something constructive for the short term and answer some questions/concerns/clarifications. The Mountains of Madness - Correct. With MoM in play, it no longer matters if your opponent has any characters remaining for the skill check. As long as they committed a character at some point during the story phase. You cannot claim an extra token as the active player. Beyond the Wall of Sleep - It's my favorite. Games get super crazy with it added in. 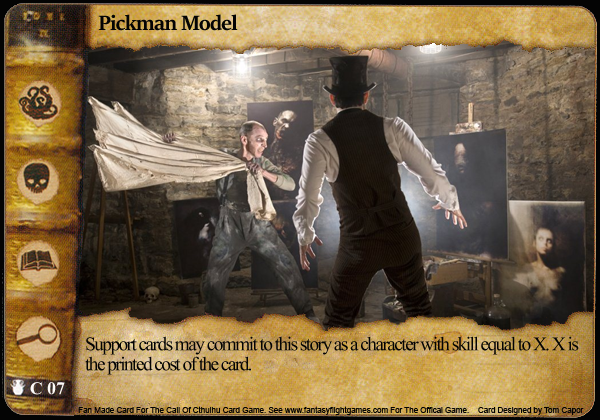 Pickman's Model - The latest version does have Non-attachment to make everyone's lives easier. Like the missing text Herbest West... I can't figure out why it didn't make it into the posted draft. On the flip side, it technically can still be played as is. If an attachment would be committed as a character... it becomes a character and follows all the normal rules for changing it's card type. However, when it's time to change it back (as soon as it becomes uncommitted, see Guardian Pillar FAQ entries for guidance)... the attachment is no longer attached to anything and is thus destroyed. Players need an additional success token in order to win this story. opponent had at this story. The Festival - Yea... me to. On the plus side, the draft packs have a new story card in it that works the original way too. But that doesn't have Graham Hill on it. The Nameless City - Hehehehe. There are a few things to remember. 1, Placing success tokens is optional. 2, If a story is won before or on the skill check, NC doesn't check. Only the most bold players dare enter the Nameless City and only the lucky or smart can claim it's mysteries. Do so while Beyond the Wall of Sleep while trying to avoid the Doom that Came to Sarnath can make for a super crazy game. One day, when the ambition strikes me I shall fix these and if we're lucky I'll make some more! With the above answered... go forth young investigators and tell me your tales of whimsy and woe! 1, Placing success tokens is optional. Indeed. Something I had to relearn myself last year because of dormant. And to clarify for others. Token placing is only optional in the case of investigation, skill, and unchallenged. Side note. Readying a character for winning Arcane is also optional.